The onslaught of animated features taking advantage of the latest 3-D technology is in full swing, and Sony’s animated production arm looks ready to join the cast of the usual suspects. 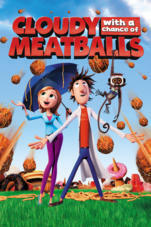 Cloudy With a Chance of Meatballs, adapted from the children’s book by Judi and Ron Barrett, feels like the kind of meal the whole family can enjoy without too much consideration for the high junk factor because it goes down quick and easy. Inventor Flint Lockwood (Bill Hader) has always wanted to create something memorable and important, but every one of his crazy ideas has gone awry, usually with catastrophic consequences for his small town. His latest dream is to build a machine that can transform water molecules into food (and not just any food — grade-A junk food and treats only a kid can love), but when the machine rockets off into the atmosphere, trouble rains down.